The concept behind Burgermeester is to offer a quality alternative to fast-food. All their burgers are freshly made and without additives: the meat is organic, the sauces home-made and they source local, seasonal produce whenever possible. They claim this not only improves the taste, but is better for the farmers and animal being consumed. 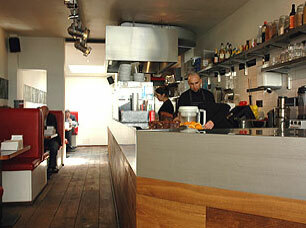 They currently have three restaurants in Amsterdam, in the Jordaan, the Pijp and close to Artis Zoo. Just past Museumplein and the Concert Hall, the Pijp may not be as well known to tourists as the central canal-ring, but this area’s high concentration of bars and restaurants makes it a popular destination for locals and visitors to the city, and the apartments here are much sought-for especially by the city’s younger residents and visiting expats. Burgermeester in De Pijp is located on the Albert Cuypstraat, just down from Amsterdam’s largest street-market. Prices range from €6.50 for a basic beef-burger to €8.50 for the Burger Royale (Aquitaine beef served with egg and pancetta) or ‘Burger of the Month’, which when we visited was wild salmon served with lamb’s lettuce and tomatoes, garnished with a lemon and dill mayonnaise-based sauce (there’s a competition to think up each month’s speciality burger). Mini-burgers are also available starting from €3.50, and a popular choice is to order any three mini-burgers for a combined price of €9.50. A large salad can be added to any burger order for €2, and there are also several side dishes such as roasted potatoes in crme fraiche for €2.50 or grilled corn on the cob at €1.50. No alcohol is served, but juices come in at £2.50 and milk shakes at €3.50, and coffees, tea and cola are also available. Those with a sweet tooth can finish of with a brownie at €2.00 or cheesecake for €3.50. Our group contained two veggies, so we ordered the goat’s cheese burger at €6.50 and a risotto burger for €7.00 while our meat-eater went for a classic lamb-burger at €7.50. The goat’s cheese option with its mixed nuts and apple-chutney was especially tasty, rendering the rocket, parmesan and pesto-based risotto burger bland in comparison. The lamb-burger, served with a red onion paste, was moist and juicy and is a popular choice which friends assure me never disappoints. You order at the bar, and then food is brought to your table. Service is friendly and efficient, with no need to wait around for your bill at the end of the meal. There are only a small number of tables and booths available, both inside and on the street but because the food is fast, it is usually reasonably easy to find a seat. Take-away, with pre-ordering by phone, is also possible. All three branches are open daily from midday until 11pm, offering tasty food, and wait-free good value for money.